Hope the first few weeks of your year have been filled with fun and excitement! Any travels of your own recently? 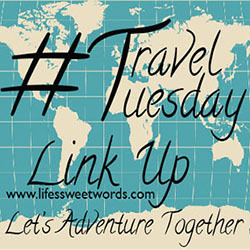 Don't forget to join in this month's link up, which can be found in last week's post. Can't wait to see all your journeys! First stop was parking. We thankfully got there early enough (around 9/9:30, on the Tuesday after Christmas) to snag a spot in the parking lot that sits next to the old fort, right along the water. We weren't sure we were going to stay there, but we purchased the maximum time allowed (4 hrs for $6.00) and headed out. 10 am: We started the morning with coffee, because I needed a place to plug in for a quick minute and send out an email for work. It was also a chilly, foggy morning and coffee was exactly what we needed to warm us up! Crucial Coffee was a cute little coffee hut that shared a courtyard with the Gourmet Hut (where you can get food). The coffee was yummy and reasonably priced. There isn't much seating inside, as you are supposed to sit out in the courtyard. However, due to a light rain we snagged the one little inside table and used the wifi for a second before beginning our day. 11:40 am: Sangria!! The nice thing about your tour package is that it includes 10% off your food and drink bill at two of the restaurants connected to the Colonial Quarter. We headed into the Bull & Crown Publick House for a quick drink before the pirate tour. We shared one, since we didn't have much time and you can't beat a bill under $5 (don't forget to show your sticker for your discount)! It was super yummy sangria too (I like to consider myself a sangria connoisseur)!! There is also some cool history to the building, which was built on an original homesite. 12 pm: The next guided pirate tour began at 12, with Captain Mayhem. What a fun tour!! Captain Mayhem was as pirate as they come and did a wonderful job of bringing history to life, as he walked us through each exhibit. While I would say that the Colonial Quarter is a better fit for an older demographic, this tour would interest even the littlest of adventurers! It was really interesting to separate fact from fiction when it came to piracy. There was a lot I didn't know, or had assumed was true, from movies. For example, did you know pirates didn't really make people walk the plank?! That became dramatized through the big screen. Babe was, of course, hanging on every word, but I loved that even while the guide was talking there were things that I could be doing if I felt myself zoning out. I listen a lot better with active hands (such a big kid), so while Captain Mayhem talked I explored the rooms and completed my treasure hunt. They had this super neat hunt, where you had to find skulls that would open drawers/ doors to reveal a treasure. You would then write down what you found and at the end you could turn in your paper to officially become a "pirate" and get a little "treasure". One more fun fact: pirates didn't actually bury treasure, they were pirates because they stole from ships and took mostly practical things that could then be traded for money, which they would then spend. 1:30 pm: We headed across the street to the fort. 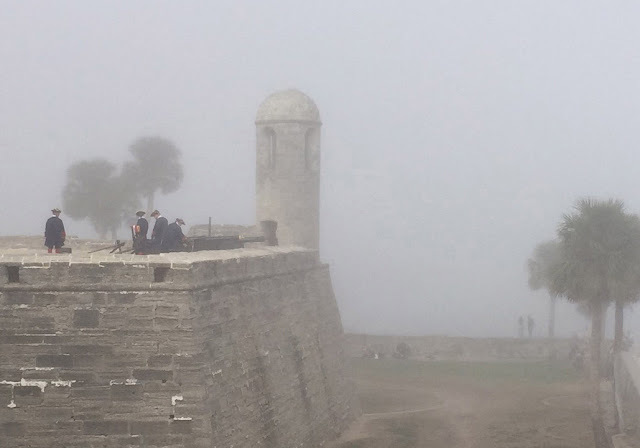 After putting a little more money in the meter, we paid our $10 admission (per person; good for an entire week) and entered the Castillo de San Marcos. We got there just in time to head up the stairs and watch the canon demonstration. The foggy morning just made it that much more exciting! It made me feel like a pirate ship might come sailing up at any minute. 2:15 pm: Homegirl got a little hangry, so before we could finish exploring the fort Babe realized I needed to eat (once I pass hunger, it takes him pointing it out to me that we need to grab a bite). So we took a break from exploring and went in search of food. There were tons of options, but we decided to go to the other restaurant associated with the tours so that we could use our 10% off. Apparently 2 o'clock, on a holiday week, is not a great time to stop for food, as the line for a table was HUGE! Thankfully we got super lucky by checking the bar. There was a table tucked into the corner that counted as bar seating and so we got cozy to enjoy our lunch at Taberna Del Caballo. It was SUPER yummy!! I got the Cuban (and of course another Sangria) and it was almost perfection! It did take a little while for the food to come out, but it was definitely worth the wait. 3:30 pm: It was back to the Castillo de San Marcos for a few more minutes of poking around the fort and getting to go in all the old rooms. 4:00 pm: We took some time to stroll through town and decided to walk towards the winery and distillery that are located near each other at the edge of town. It was a good little stroll (maybe 15/20 minutes), but we got to see a lot of the little corners of the city. 4:20 pm: Winery tour and tasting fun at San Sebastian Winery! Due to the crowds, because of the holiday, things were set up a little differently. Instead of a wine tasting with scheduled times they had a walk through tasting set up. There were stations on both floors of the winery, with a different wine sample at each station. I really liked the ability to go at your own pace without feeling like you were holding up others, or feeling rushed to finish, depending on the pace of the group. San Sebastian is actually the sister winery of Lakeridge Winery where we have been on occassion, so it was actually the same wines with a different label, but it was cool to see the difference in presentation. 5:15 pm: St. Augustine Distillery tour! We actually started here originally (figured start with the hard stuff and work down to the vino), but they were so crowded that the first time available for the tour wasn't until 5:15 (we got there around 4:15). You could opt to do the tasting room, but we wanted to see the process and the distillery. With the winery being so close it was easy to change up plans and head there while we waited for our distillery tour time. We still got back to the distillery a bit early, but their waiting area is a really neat little museum with history of the old ice plant that the distillery is housed in, as well as the distilling process of bourbon, gin and vodka. The tour itself was really neat!! The guys that run it are very passionate about their booze and make the tour a lot of fun. Note: the warehouse is not temperature controlled; since we were there in December it wasn't too warm, but just make sure if you go in the summer you take water with you, because it is known to get really hot! After being walked through the distilling process and getting to see all the machinery, it's off to a special tasting room for those that took the tour. I was nervous, because I am not really a liquor drinker, so the thought of sipping straight vodka had my stomach turning. I was pleasantly surprised to see that they actually give you little mini cocktails!! We started with a Florida mule (yum), then moved onto a rum punch. You only get to try those if you do the tour. From there they move you into the main tasting room to try the Old Fashioned (Babe very much approved) and a Gin & Tonic. Babe liked the bourbon so much he grabbed a bottle to take home. We really loved the tour and would definitely do the whole thing again!! 6:15 pm: We were planning to eat dinner at the Ice Plant that is actually attached to the distillery, but our car was back at the original lot we had parked in near the fort (we weren't sure what parking situation would be at distillery; they have plenty and it's free). Our walk back to get it was really nice. They light up St. Augustine for Christmas and it was beautiful!! We look a slow walk back, stopping to enjoy the lights and also take a peek around Flagler College. The school is stunning!! It is housed in the old Ponce de Leon Hotel and makes you literally feel like you are in a scene from some old movie that takes place in a boarding school (major points to anyone who has seen The Trouble with Angels). Being decorated for Christmas just made it that much more beautiful!! 7:00 pm: Dinner at the Ice Plant! Can you say, Oh. My. Yum?! One, this place has a super cool history! You are actually eating in what use to be the old ice factory, dating back from 1927. They keep with the 20s feel and it makes the atmosphere really cool (pun intended)! The bar makes amazing craft cocktails, each using a specific kind of ice depending on what you order. And then comes the amazingness that is the food!! My parents actually headed to St. Augustine that night to celebrate their anniversary and joined us for dinner, so we all got different meals in order to enjoy a little bit of everything. We started it off with the beef carpaccio and fried oyster appetizer, which I then actually ordered a second time as my meal, because happiness!! We also got the soft baked pretzel and loved that too. Our meals consisted of the pork belly, the fish of the day, and the butternut squash and mushroom lasagna, which were all amazing. This should definitely be on your list if you head to St. Augustine. You may be in for a longer wait as they do not take reservations, however, they have a one-of-a-kind bar to enjoy a drink at while you wait. Plus we were originally told over an hour wait time and were seated within 30-40 minutes. Cost: Between drinks and food this was the most expensive part of the day, but so worth every penny. Meals average to about $20-25 per person and drinks about $10. Parking: We ended up paying $12 to park (full 4 hours/ paid twice), but there is a garage as you enter the city that has $10 all day parking. It would have only saved us $2, but we also wouldn't have had to worry about heading back to pick up our car before dinner. also, if you are willing to walk/ plan to head to winery anyways, there is side street parking nearby that is free if you get there early enough to snag it. We had an absolutely wonderful time and couldn't recommend a visit more! 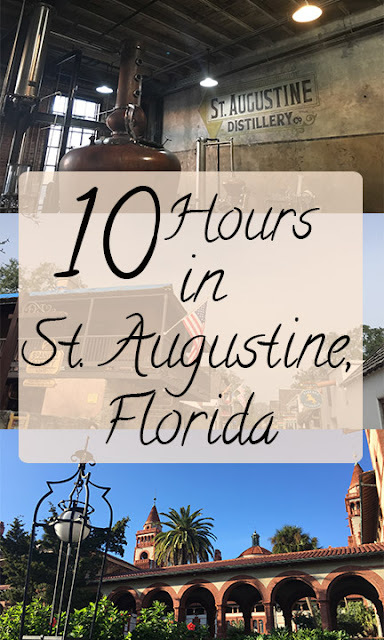 Have you ever been to St. Augustine? Where have you been traveling lately? We've been meaning to go forever! Looks like so much fun! It really is a great time! Hope you make it there soon! It really was a fun-packed day! Ditto! I have seen pictures of the forts in San Juan and think "I want to go!" Maybe we will get the chance to compare soon!! Thank you for these great tips! We live even closer now and go over a good bit. Will have to try these!! 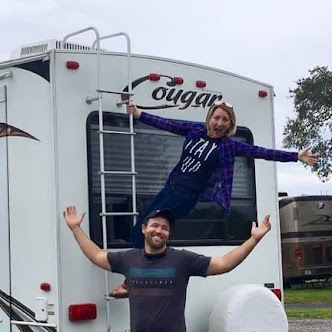 Adventure Fun and A Giveaway! Great Gift Ideas for a Book-Loving Adventurer! !